This property is 11 minutes walk from the beach. 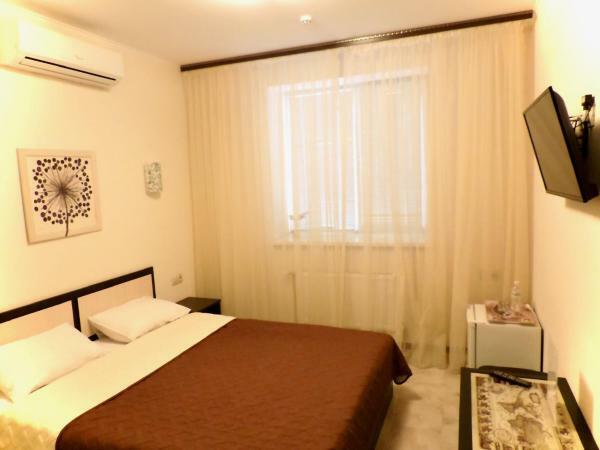 Breeze Hotel is located in Odessa, 7 km from Spartak Stadium. Guests can enjoy the on-site cafe. Chernomorets Stadium is 9 km from Breeze Hotel, while Deribasovskaya Street is 9 km away. Central Airport is 6 km from the property. This double room features air conditioning, tea/coffee maker and kitchenware. This double room features a tile/marble floor, kitchenette and kitchenware. Passed by, decided to go — to find out what the place was in full boorish in tone welcomed by the administrator (aunt damaged), like that on the street is not written, what is it? Although no signs, no information, that this hotel, in addition to just "breeze" was not. In the end, the observation that so don't talk to potential guests, she continued to be rude and even ran out and cried after the insults… for the hospitable Odessa it's some "earth-shattering" event. Of course, staying there did not have the desire, and to write a review to warn others — Yes. Booked for a month, I decided to call to check, it turned out that I was in emergency at both of the rooms. Texted the decency to not call back. Thank you, I had half a day to kill on hotel search! Booked this hotel… on the phone we all confirmed but when I arrived at the place the door was closed, and the administrator had to go somewhere, the phone also nobody answered… so we stood for about an hour at the door and went to find another hotel. About projivanii the hotel can not say anything… But I do not recommend it is in the private sector next to no transport no shops no decent cafe… If 1 night you can… And to go for longer is not worth it… tonight will be boring. The best 100-200 more expensive to rent a hotel but closer to the center and normal infrastructure. Price-quality, cleanliness, comfort. Close to the center. Please inform Breeze Hotel in advance of your expected arrival time. You can use the Special Requests box when booking, or contact the property directly with the contact details provided in your confirmation. All children under 2 years are charged UAH 50 per night for children's cots/cribs. All children under 16 years are charged UAH 50 per night for extra beds. All further older children or adults are charged UAH 50 per night for extra beds.